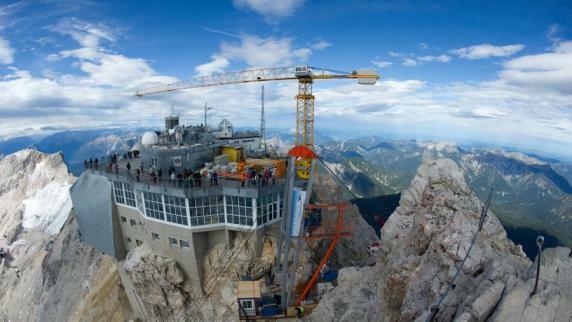 At 2,962 m (9,718 ft) above sea level, the Zugspitze (or ‘front of the train’ if you’re into direct translations) is by no means a very tall mountain, but in Germany it is the tallest. While its once mighty peak has been paved over and can be reached by both a train and gondola (hooray tourism! ), those seeking a bit more alpinism can take the popular Höllentalklamm route (Hell’s valley gorge). Those seeking even more alpinism – with the added adrenaline dose of climbing along a super exposed ridge for about eight hours – can tack on the Jubiläumsgrat (jubilee ridge). On a long weekend with a window of good weather, this was what Jakob, Stefan and I set out to do. We arrived at the town of Hammersbach before the sun came up and immediately began hammering trail to get out in front of the crowds. The route is extremely popular and while I’m generally a laid back guy, the idea of being out in the mountains and waiting in lines doesn’t sit well with me. 4 Euros lighter and the adventure begins. Over plank ways and through well-lit tunnels, the beginning of the route is surreal in that you wonder the whole time how on earth they built it. It takes hikers straight up the gorge on a path that would normally be nearly impossible. Even if you opted to only do this first part, it would be worth the price of admission. Once out of the gorge, we did our best to move ahead of a couple of groups before reaching the start of the via Ferrata and potential queuing. Depending on what part of the world your in, Via Ferrata, Klettersteig or the Iron Way are all essentially alpine routes that are secured with a metal cable. What this means for people like me (not a really good climber) is that with a harness and a via Ferrata set (two small ropes and two carabiners that allow you to always be attached to the cable), you are able to quickly climb crazy routes that would usually take days using trad gear. It’s rad. The industrious duo of Stefan and Jakob. Two strapping young German men always ready for a bit of adventure. Good vibes abounded. Mountain man Jake felt a blister coming in hot so he got proactive. After a couple of hours of mixed hiking and via Ferrata, we reached the foot of the Höllentalferner glacier. Having never used crampons or climbed a glacier in my previous 25 1/2 years, this was to be my maiden voyage. Stefan wants you to know that he is now accepting outdoor/adventure modeling jobs. Just go to www.stefansimak.de to book (and check out his photography too maybe)! Navigating the glacier was relatively straight forward. We made sure to follow the tracks of others and stayed well away from the crevasses. While our venture was without incident, the discovery of some destroyed poles, a helmet and a busted-up camera, was a chilling reminder of how dangerous the monstrous tongues of ice can be. The route led us up to another section of via Ferrata, which then led to great views of the glacier and the slew of hikers working their way up the ice. The remainder of our day was spent climbing through clouds. This was bad for views, but good for my slight fear of heights. After a relatively quick six hours, we reached the summit. And enjoyed the awe-inspiring view. It was only noon, so we took advantage of the famous luxuries of climbing in the Alps. We drank Weizen, took a nap and booked ourselves in for an evening at the Münchner Haus alpine hut to rest up for the second and more foreboding leg of our journey: the Jubiläumsgrat. Stefan became sick during the night and bowed out of day two, so Jakob and I got up and out before sunrise to try our hand at the ridge. The Jubiläumsgrat is the ridge that connects the Zugspitze to the Alpspitze via several other smaller peaks. It is highly exposed with nearly 500m drops to either side throughout and mixes via Ferrata with sections that you can either use a rope on or choose to climb unsecured. With the entire expanse of Germany unfurling beneath us, the early morning view from the ridge inspired a mix of reverence, elation and anticipation I have only found in the mountains. The cold weather, thin air and underlying feeling of danger demanded a visceral reaction. It’s also just an outrageous view at all times. I embrace doing things that put me out of my comfort zone. I relish the otherworldly focus required when climbing around on exposed rocks or pushing on a mountain bike. I have however, never done anything quite like this. While all of the climbing was easy and straight forward (some 3.4/3.5, but mostly just scrambling), I struggled to shake the feeling that if I made any sort of mistake, I’d be toast. Even on sections where we could clip into the via Ferrata, the exposure was so extreme it did little to calm my nerves. While I felt physically capable for the task at hand, I found I was not quite mentally ready for the hours upon hours of focus required to make it through the route. After any tiny mistake, my heartbeat would come blasting into my ears and throat and the process of calming myself down was often a challenge. Even the spots where we chose to take breaks often left us with our legs hanging out over the abyss. Before I go and get too dramatic, I want to say that while we were making our way along mostly just trying to have some fun and keep from shitting ourselves, two guys literally jogged by us wearing trail running shoes, short shorts and without harnesses or any climbing gear. They had come all the way up the Höllentalklamm that morning where they had shared one pair of crampons (one using the left, the other using the right) to run up the glacier. I mention this because while for me this was one of the most challenging days out of my life, for others, it was just a nice Sunday death-defying jog. Ultimately, Jakob and I made a good team. Whenever one of us would get down or lose focus the other would inject some positive energy or just take the the added weight of the 60m rope that we never used. We were able to rely on each other and there was never any question that we were going to finish the route. Even in our lowest moments, we just gave voice to our nagging fears and were able to laugh at ourselves and keep moving forward. Utterly wiped, we did the final scramble up to the Alpspitze (the least technical of the whole route) in one minute bursts punctuated by one minute pauses. We took our picture and got straight to work climbing down, the “I’m-never-doing-this-again” thoughts already replacing themselves with plans to climb other mountains. We made two mistakes on the route. The first is that we had way too much weight. Everyone else we saw had nearly nothing with them and seemed much happier. The rope, extra shoes, my sleeping bag and too much food – this was weight that over less challenging terrain wouldn’t have made a big difference. It made a huge difference here. The second was we totally misjudged how long and demanding the route was. There were really very few sections where you could actually relax. Time and time again we would get to the top of a peak thinking there was only one peak left to go only to see several more peaks we hadn’t seen. This made judging our effort difficult. Even at the end when we lugged our corpses to the top of the Alpspitze, we didn’t realize we had another hour and a half of via Ferrata down to the cable car. It was like insult to injury. All of that being said, I can’t recommend this trip highly enough. It is the best (or at least most extreme) weekend trip I have ever been on. 10/10.